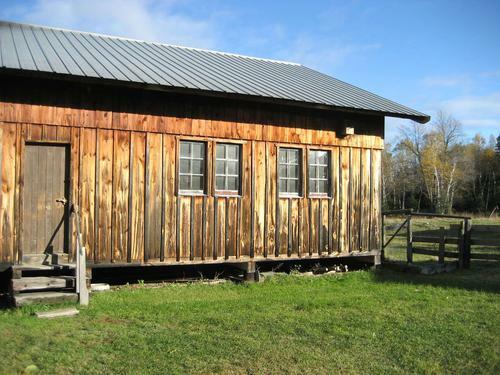 This workshop was built in the early winter of 1986, after a fire destroyed the previous workshop and barn in November. With winter already starting, my dad decided to put the whole building on wooden posts (old telegraph poles) instead of concrete foundations. Considering how some of the concrete cottage foundations worked out later on, that was probably a wise choice. My dad used this workshop for 26 years until he passed away in October 2012. 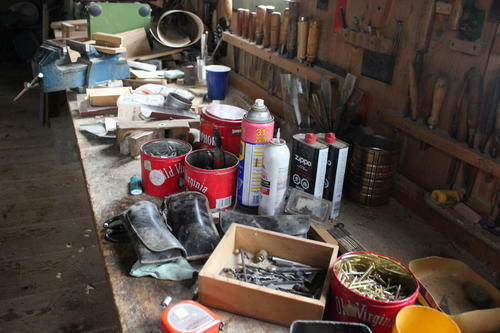 In his last years, he let the workshop get into a bit of disarray, so on my visit over the Christmas 2012 holidays, I took some time to dust out the shop, clean it up, and then do a picture and video tour of the workshop. Inside the main entrance. 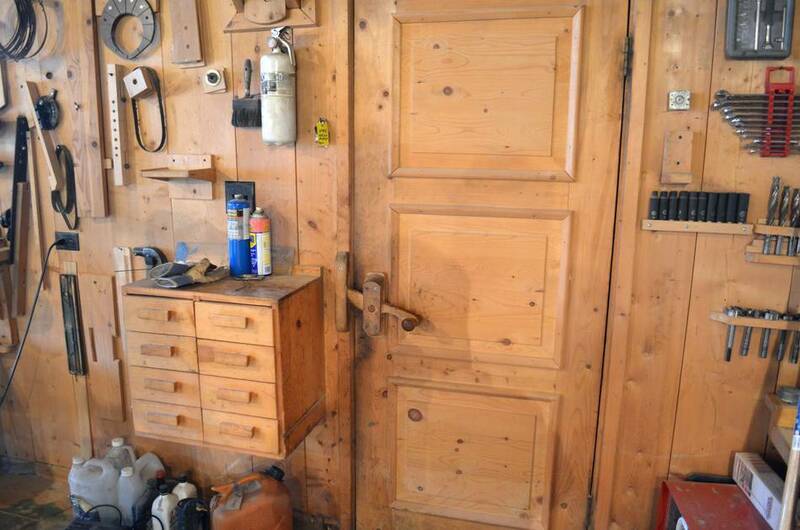 A paneled wooden door with a wooden lock, not unlike what my dad made for the cottages. Heat in the winter came from this wood stove, basically, a barrel stove using a Sotz barrel stove kit. 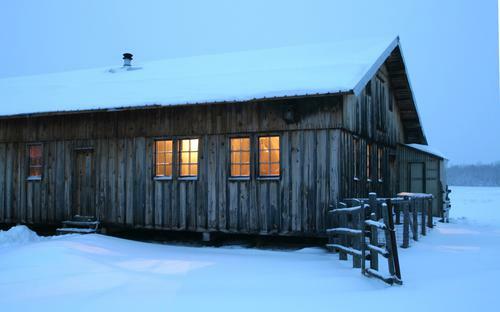 The old workshop had burned down on account of the wood heating system. Presumably, a spark got out of the stove and into some sawdust. A truckload of lumber stacked in front of where the fire started, plus a power outage that day (therefore no water) prevented the fire from being put out before it got out of hand. 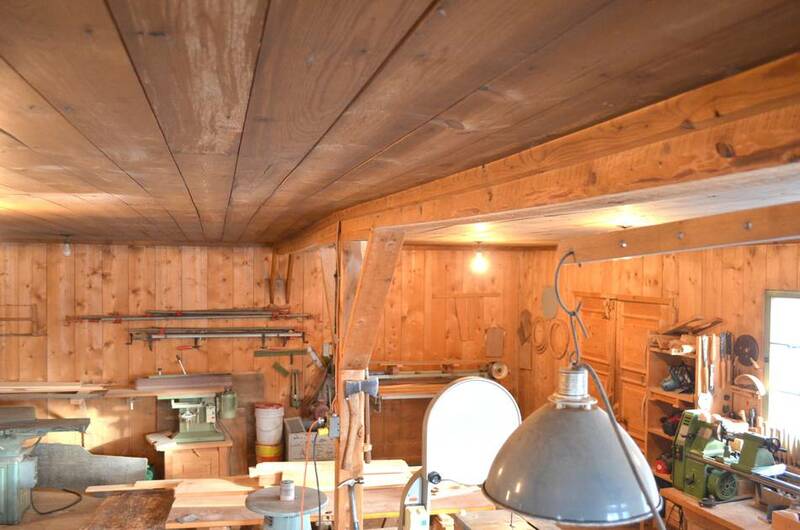 So for the new workshop, my dad decided to put the wood stove much more in the open, where trouble could be spotted and attended to more easily. There was no fire insurance for the old shop, nor for the new shop. Insurance companies are not keen to insure wood fired wood shops, and given the premiums they were asking, we were still considerably ahead without insurance, despite the fire. 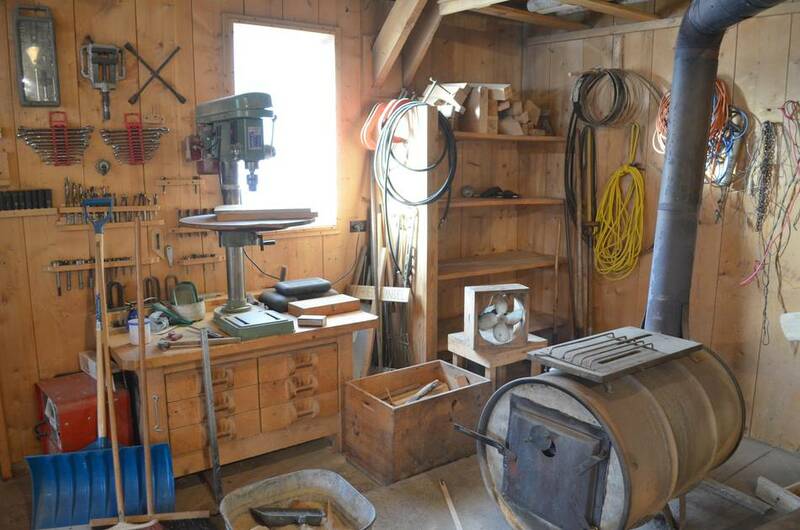 The drill press, next to the wood stove. I don't know why my dad decided to put it here, in my shop, the drill press is one of the machines I turn to a lot. Though when I brought home a small drill press to have at the camp, my dad confiscated it and put it nearer to the workbench. Looking left of the previous picture. Nearest, my dad's homemade table saw. This saw didn't get much use after my dad built it, and mostly it was used as a table to store clutter. 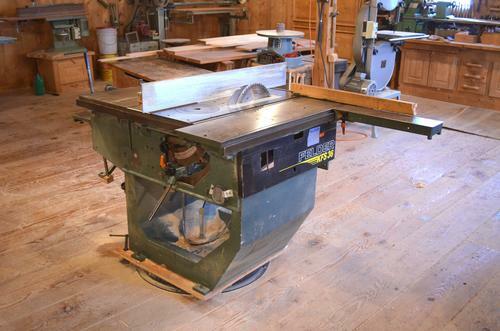 Behind it, the Felder table saw. 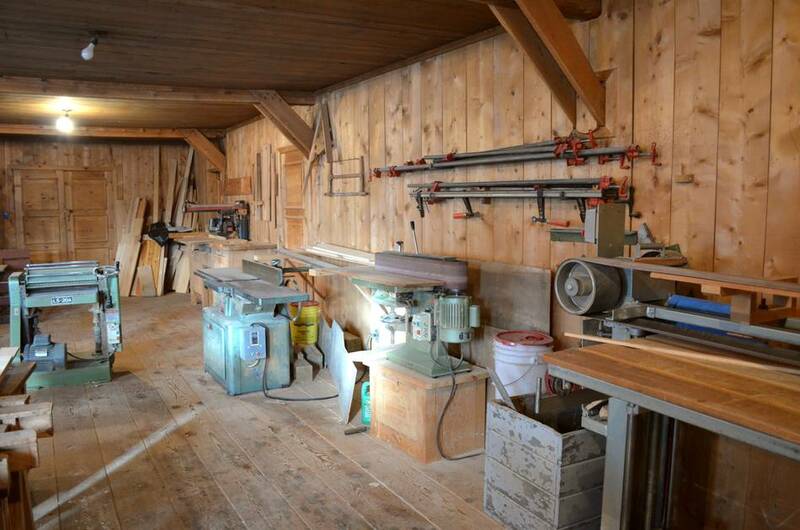 Also visible, both bandsaws, and the workbench area in the south-west corner of the shop. 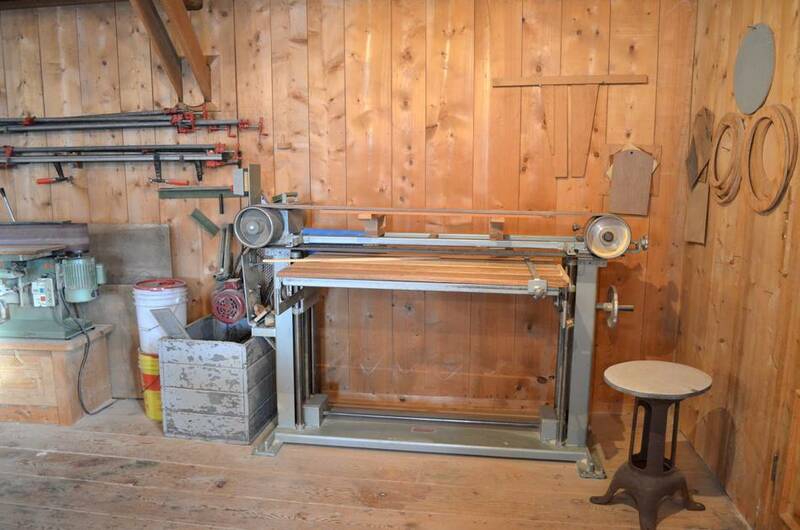 The main machine of the shop was my dad's Felder KFS 36 table saw / shaper / slot mortiser machine. Back in 1986, Felder did not have offices in Canada, and my dad traveled to Austria to order that table saw. This is a massive machine, but, ironically, by European standards it was considered high-end hobby equipment. 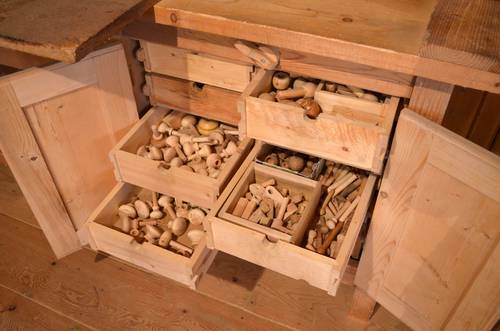 Professional cabinet shops would have used better equipment. 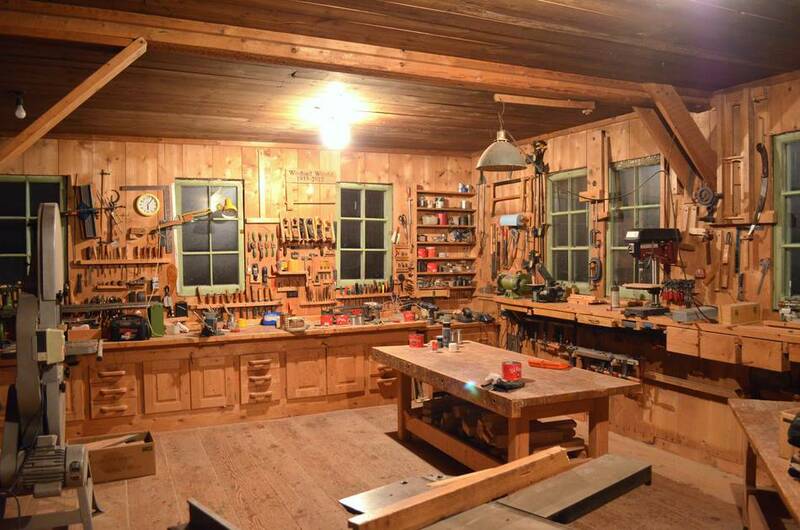 The workbench corner, at night. 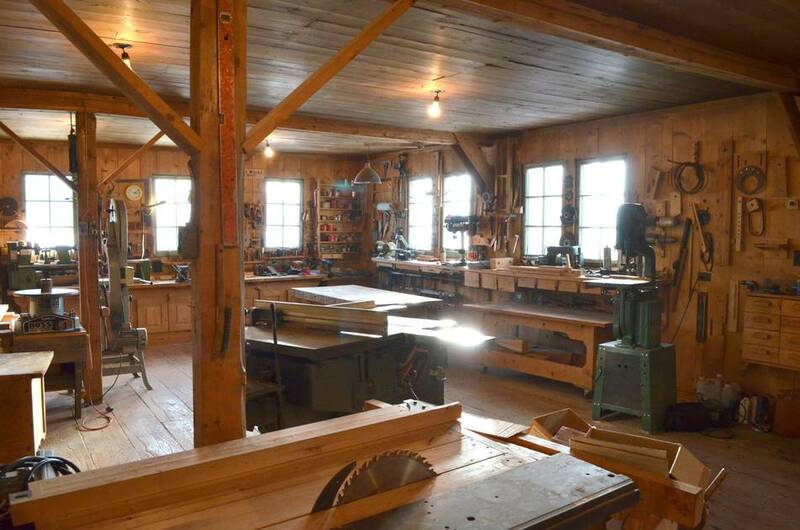 During the winter, my dad would work in the workshop every day except Sunday, and after supper he'd go to the workshop to work some more till about 8 PM. 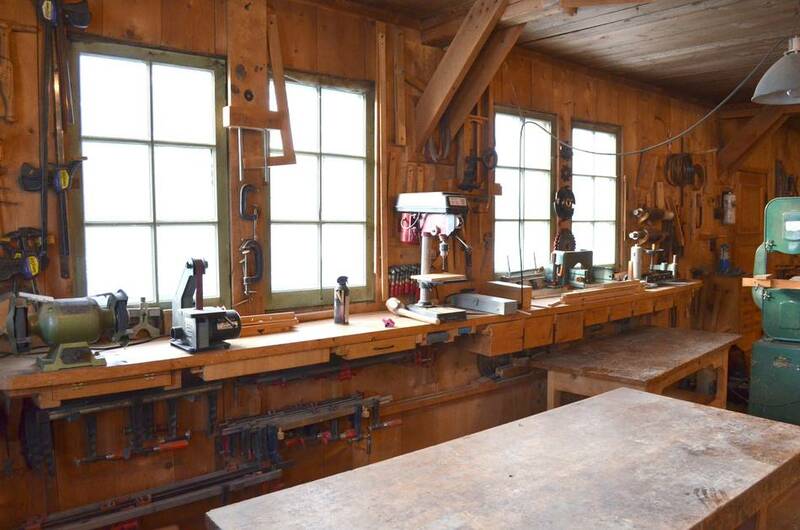 Woodworking was both his job and his hobby. The workbench on the south wall. 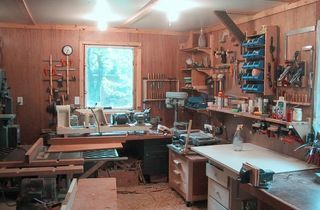 Except for the vise and the lathe on the left end, this workbench was mostly used to just put things down. 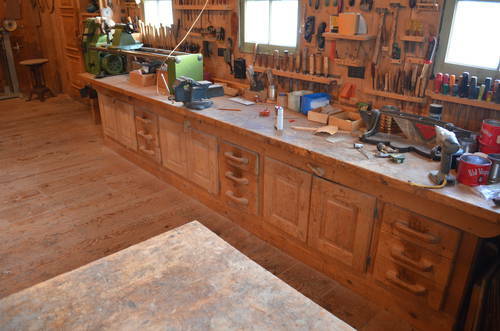 Looking over the main assembly table, to a shelf on the west wall. You can see the small drill press I mentioned earlier. Paneled doors on the workbench on the south wall. 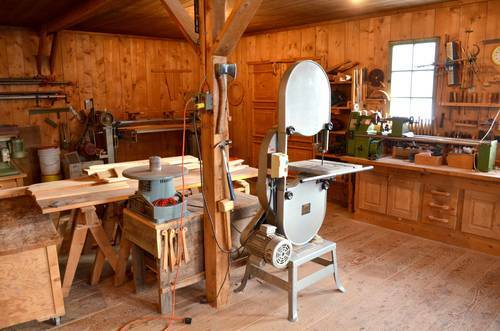 The oscillating spindle sander, and 18" bandsaw. The spindle sander was a relatively late addition. 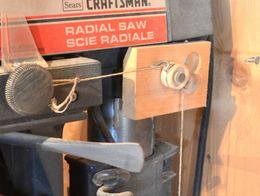 Before that, my dad mounted a sanding drum in his shaper when he needed to spindle-sand. 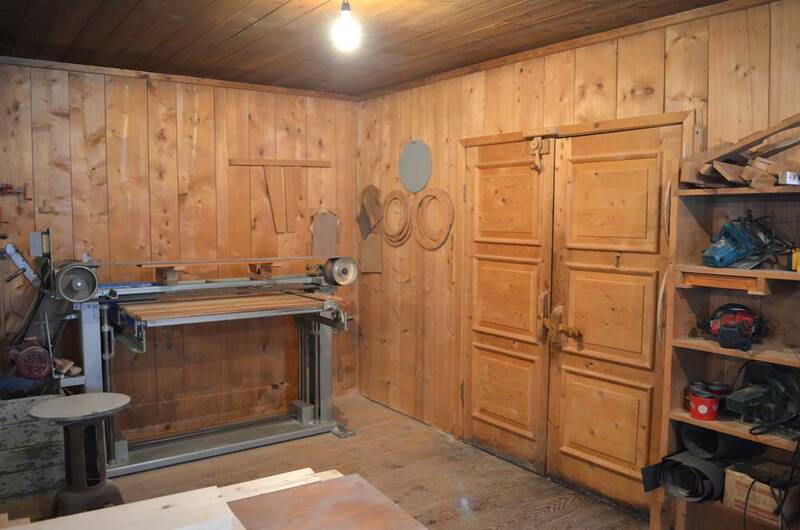 The bandsaw was an earlier acquisition. 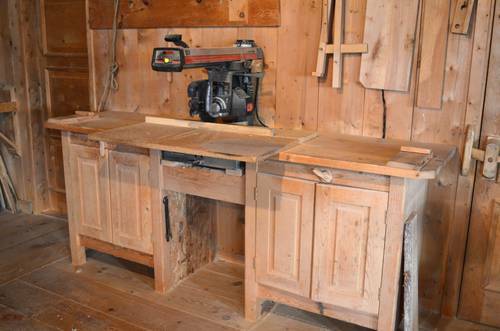 It was one of the first power tools in the new workshop, we brought it back from a shopping trip to Toronto (700 km away), my dad went off to Europe (to shop for the table saw), mom and I came back with the bandsaw. I put it together and ran 240 volts thru several 120 volt extension cords to try it out! It was never a very precise saw, but it saw a fair amount of use for rough cuts. The blade guides on it are not very good! At some point, I thought I should try to tweak this saw to its maximum potential, but it turns out, the blade guide column just cannot be made parallel to the blade! I now think the best way to improve it would be to re-use that motor to build a better wooden bandsaw. 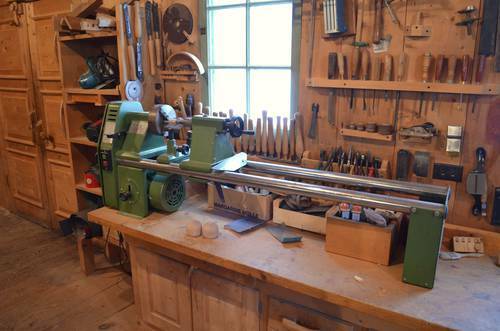 The lathe. My dad used that lathe a lot, he made all his own wood turnings, including any knobs that he used. My dad kept an inventory of knobs and hinges to use on projects. 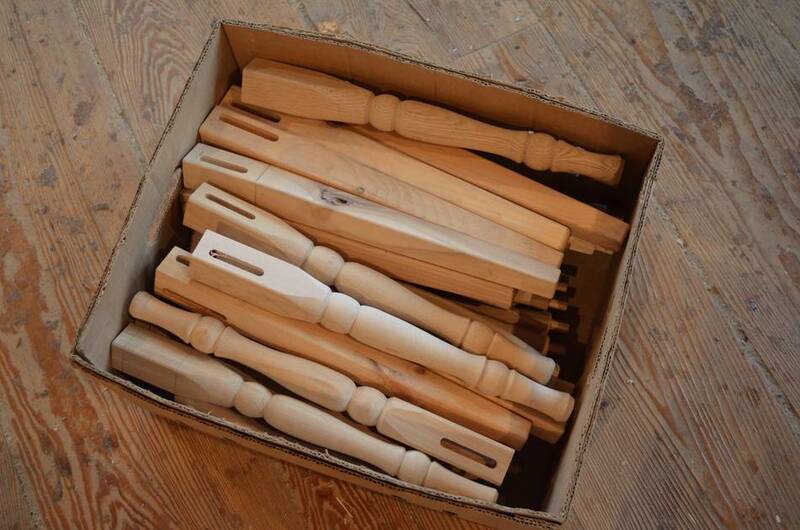 Once he started making knobs, he'd make a lot. I also found a lot of chair parts left over when I cleaned up the shop. 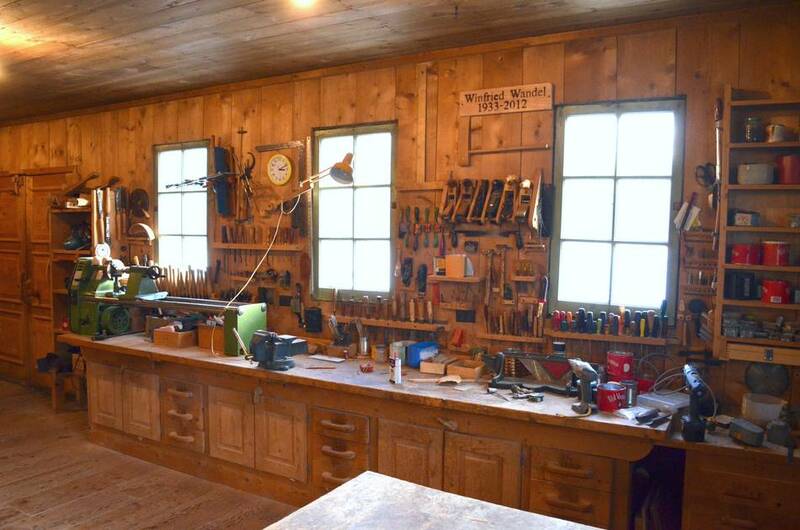 I guess in his last years, he didn't precisely work out how much of each he'd need and just made parts and then assembled chairs until he ran out of something. The double doors on the south wall of the shop. Also paneled doors. On the left, the stroke sander. I love this door latch detail. A stroke sander is used for roughly the same applications as a thickness sander, but the long belt is pushed down on the work piece with a pad. It takes a bit more skill to operate than a thickness sander, but it's faster. A big downside of a stroke sander is that it's just about impossible to capture the dust coming off of it. But my dad never believed in dust collection, so the dust just went flying everywhere. The air in the shop got pretty thick when he was using that machine, and I'd avoid spending time in there when he was sanding. Looking north along the east wall. 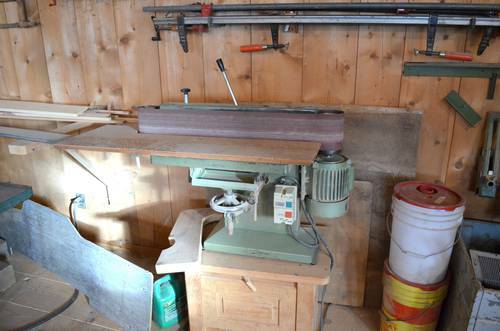 Thickness planer, jointer, edge sander, and stroke sander. The edge belt sander. 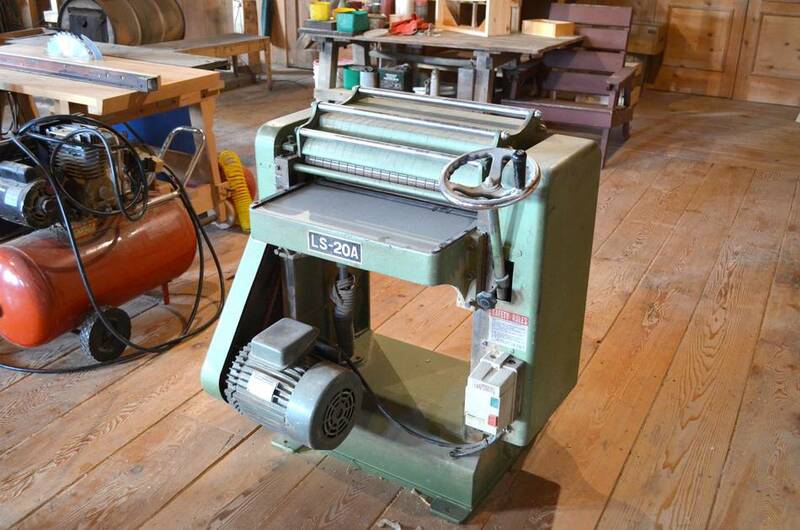 I really liked using this machine to round over edges. Looking south along the east wall. 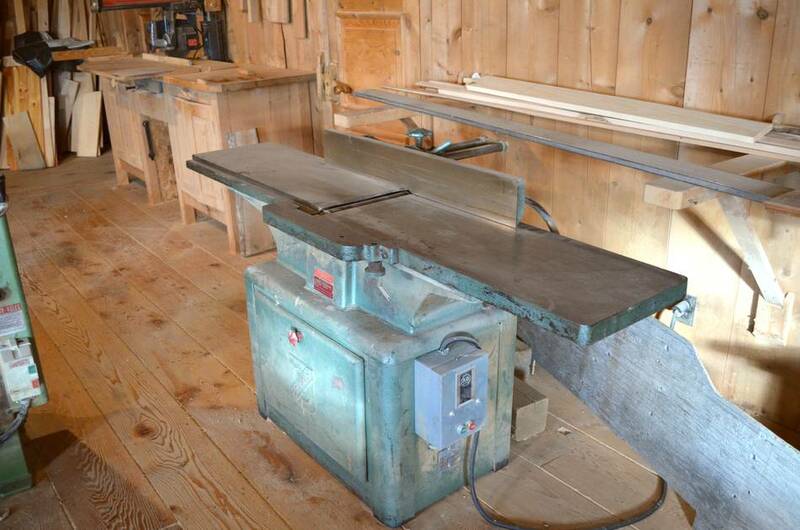 My dad's 12" Poitras jointer. A very massive machine, even the stand is made out of cast iron! Every board that ever came out of my dad's sawmill after 1986 was planed on this thickness planer. When I gave it a careful going over, I found the main bearings had about 0.1 mm of play in them, so they really should be replaced. 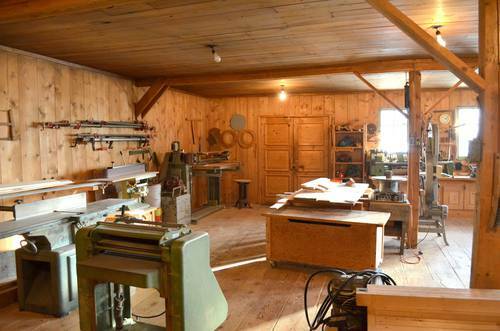 But without my dad, this shop won't get a lot of use, and the planer still works as it is, so I'll leave it as is. The door to the "shavings" room. The idea was to just push the shavings out that door and let people come and pick them up for horse bedding or whatever. There were always takers for the shavings. 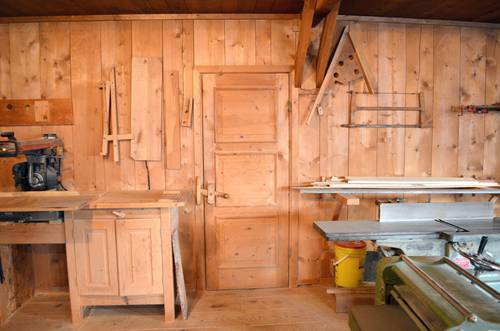 When I still lived at home, it was often my job to take the boards out of the planer when we planed a whole pile of lumber. Once the pile of shavings got nearly as high as the planer, we'd stop and push the shavings out the door. 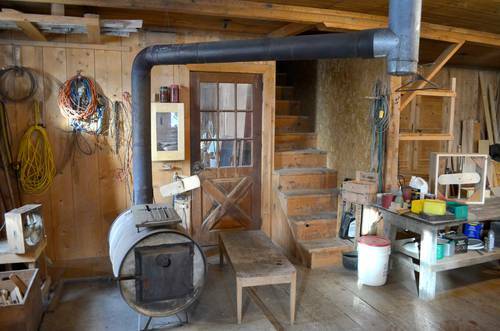 In later years, when my dad wasn't building cottages anymore, there were not as many shavings and my dad just shoveled the shavings straight into the wood stove. A Sears Craftsman radial arm saw. My dad used his radial arm saw mostly for making rough cuts in lumber. 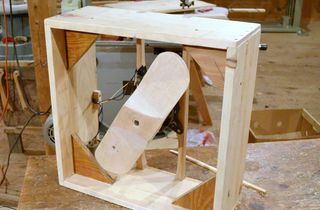 Where it's mounted, the saw ended up having a slight forward slope, so it would always wander forward slowly with the vibration of the saw running. Considering how a radial arm always tries to lunge forward when it engages the wood, I figured this might be an accident waiting to happen. So I attached a pulley to the side of the saw and added a string and weight to always pull back on the saw to counteract this tendency. I guess that held up well for these 26 years. 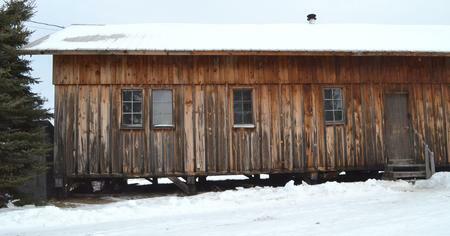 The north-east corner of the shop. 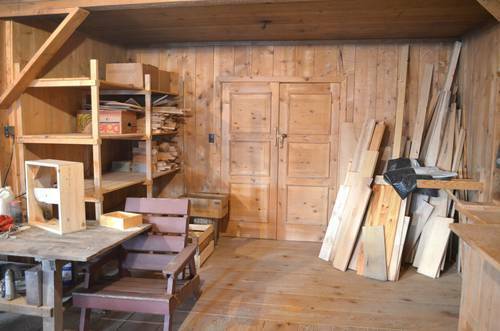 The double doors lead to a storage room. On the shelf, and leaning in the corner are lots of cut-offs. In his declining years, my dad saved every scrap of wood, so the shelf, and just about every cubby-hole was full of cut-offs. On cleaning up the shop, I decided that all but the largest of these should be firewood. I filled over 30 recycling-bin sized cardboard boxes with small pieces of wood! Small scraps of wood all have their potential uses, but the problem is, there are always way more off-cuts than there is use for, so there's no point in saving too many of them. A wedge shaped piece of scrap can be very handy here and there, and so my dad always saved all of those. There were boxes full of wedges! 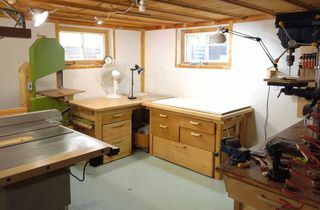 And plywood costs money, so save every scrap bigger than a postcard! My dad asked me to build this cabinet for next to the door, so it's a different style from the rest of the shop cabinetry. 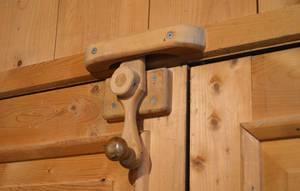 Even back then, I always varnished this sort of thing, so the wood wouldn't absorb dirt so much. 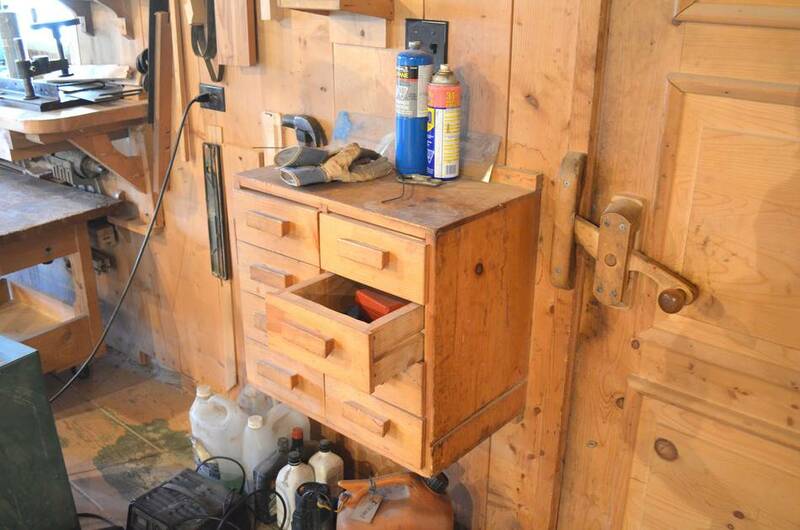 I wish my dad had varnished the shop cabinets he built. They'd be much cleaner now if he had. The workshop has a nice big open attic for more storage. Another one of my contributions was the trap door counterweight. The steel cable (diagonal) in this photo attaches to a counterweight in the background via two clothesline pulleys. The counterweight is just a wooden box filled with rocks. The piece of wood sticking up at an angle in the foreground is attached to the trapdoor, and prevents the door from falling over once it's opened. But I found that if the door was opened too fast, the stop would bounce off the floor boards, and the door would start closing again. So I made a small box on the floor, filled with sand. The leg pushes into the sand in the box, which absorbs most of the momentum. Surprisingly, that mechanism has held up for 26 years now. 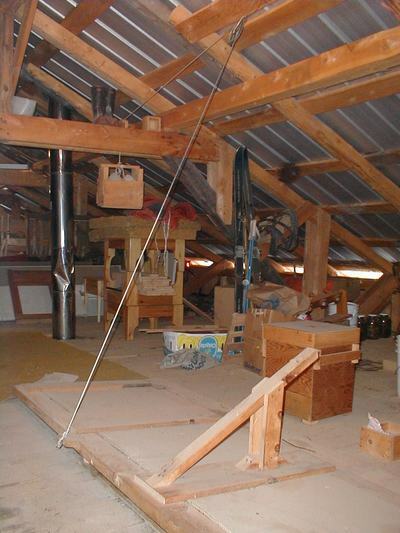 Some of the beams and floor joists should perhaps have been bigger, and have sagged a little over time. There were no drawings made for this building, and no calculations made. 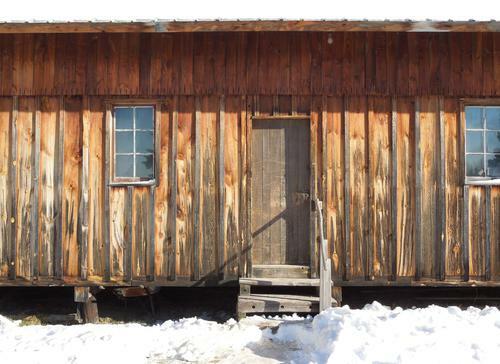 It was just built by intuition, with available materials, and in a bit of a hurry before winter fully set in. 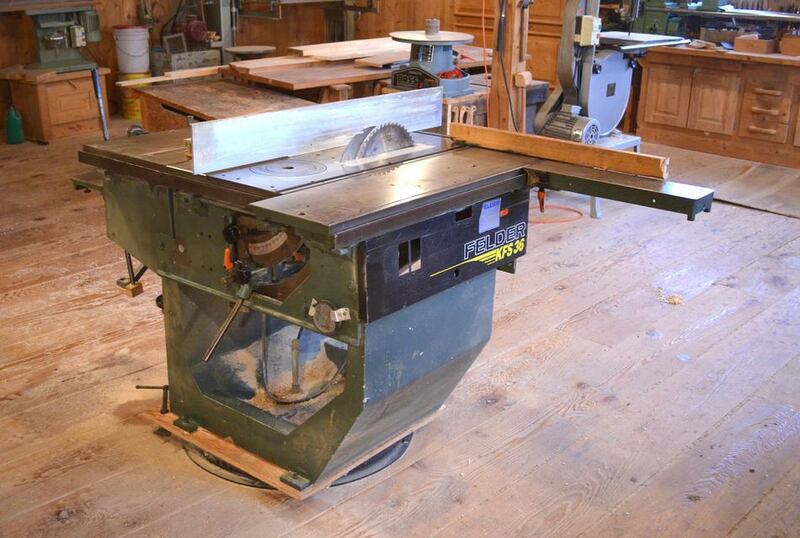 The Felder table saw was much heavier than anticipated, so the floor has sagged a little around that area as well. But, all things considered, the building has served its purpose. 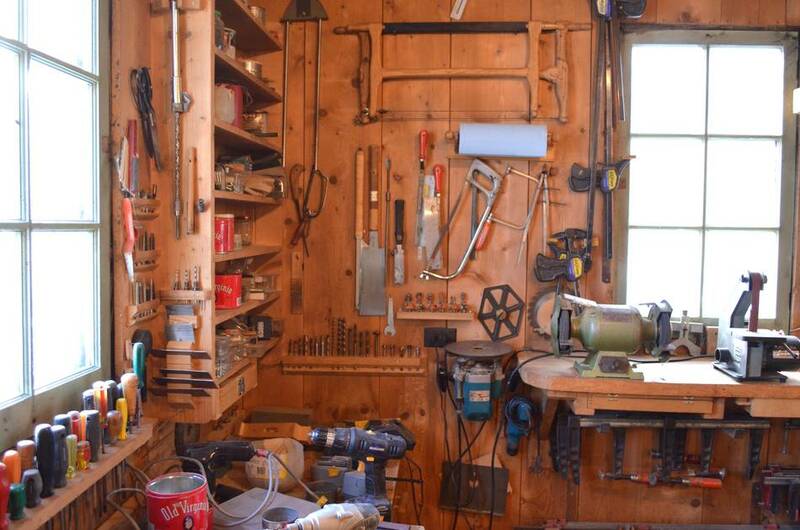 I used to wonder what would become of all the tools once my dad passed away, figuring I would take some of them. But now that he's passed away, I have no desire to in any way dismantle that shop. If anything, I'd like to upgrade things here and there, maybe add dust collection. But I'll only be using that shop a few days a year, so there is not much point in that. But it feels good having cleaned it up, and I also tweaked some of the machines and made sure the machines have sharp blades in them again.